Basque Country in northern Spain has long attracted anyone interested in trying some of the world’s most celebrated dishes. The region’s restaurants have earned around 30 Michelin stars, and one city, San Sebastián, has the highest concentration of Michelin-starred restaurants per capita in the world. Another unofficial capital of the autonomous Spanish Basque Country is Bilbao, which has a strong, centuries-old culinary presence as well. But you don’t have to eat at a world-renowned restaurant to have a spectacular meal in Basque Country. 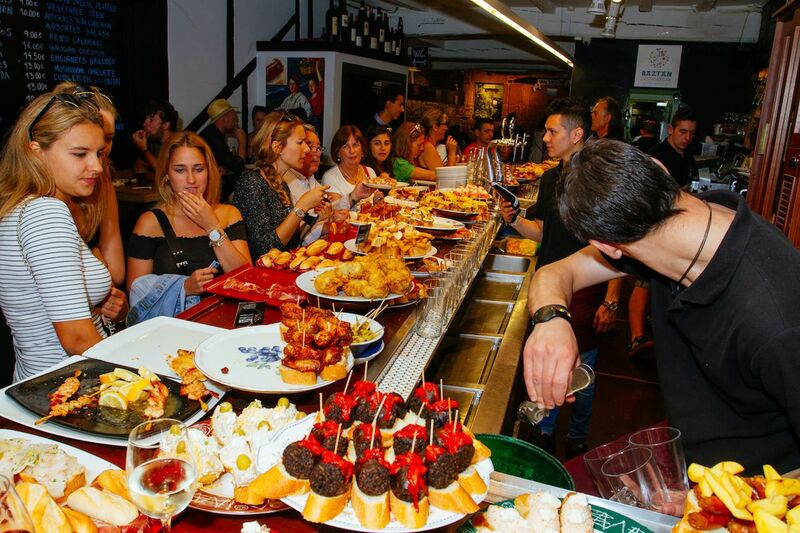 Pintxos, small snacks similar to tapas, are served in nearly every tavern in the region, and indulging in a pintxo crawl is a fun way to jump into Basque culture and mingle with locals. As a tourist, you’ll mostly be left to fend for yourself, though there’s no reason to be shy about asking questions at the bar. And while there’s no wrong way to do a pintxos crawl, the best way is to follow what the locals do. It’s easy to confuse pintxos and tapas. 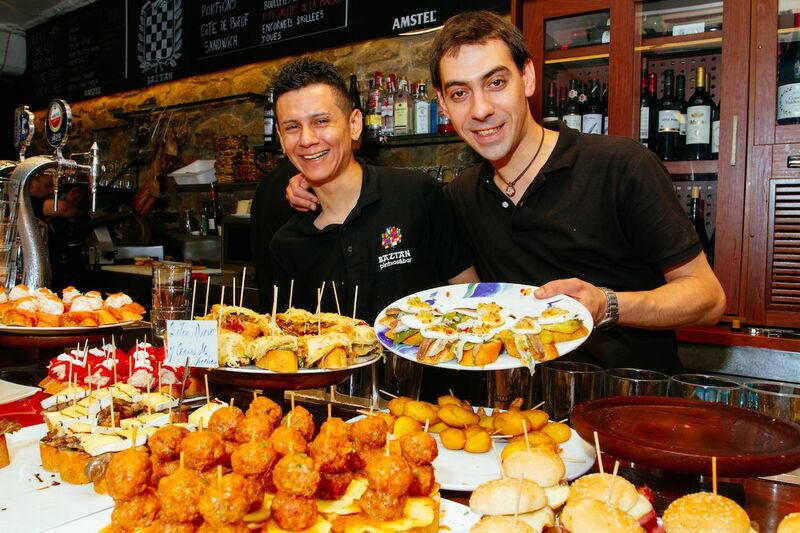 While tapas are small portions of food served on plates, a pintxo (pronounced “peen-cho”) is a bite-sized snack served on a toothpick in Basque bars. Basque is the prominent language in the region, but the name pintxo comes from a colloquialization of the Spanish word pinchar, which means “to puncture,” as in puncture meats and vegetables with a toothpick. A small slice of bread is usually served alongside. Like tapas, pintxos are communal (while you don’t share a skewer, they’re often sold in multiples). You can expect to pay between $1.50 and $3.50 per pintxo. It’s hard to eat just one pintxo. When you’re at the bar, you’ll see a display of room temperature pintxos you can choose and grab for yourself when you order a drink (depending on the bar as sometimes someone will serve you). Keep an eye out for a chalkboard showing the hot options that you can order from the bartender that will be cooked and brought out to you. One of the more famous pintxos is the Gilda, which is made with olives, an anchovy, and a pickled pimento (speared on a toothpick, naturally). According to legend, it was created at Casa Vallés in San Sebastian in the 1940s and is named after the Rita Hayworth film Gilda. The pintxo is verde, salado, y picante, which was interpreted as “dirty, charming, and spicy” like Hayworth’s Gilda. Or so the story goes. Other common options include octopus with smoked paprika that’s perfectly tender, never chewy, and garlicky prawn served with or without bread. Basque Country prides itself on high-quality seafood, but there’s also an abundance of mushroom, pork, and zucchini pintxos. If a bar has a particular pintxo it’s known for or has a special that day, it’ll likely be prominently advertised. Pintxos steal the show at Basque Country taverns, so choosing what to sip on is an easy task. January to the end of April is cider season, and they take their cider seriously here. 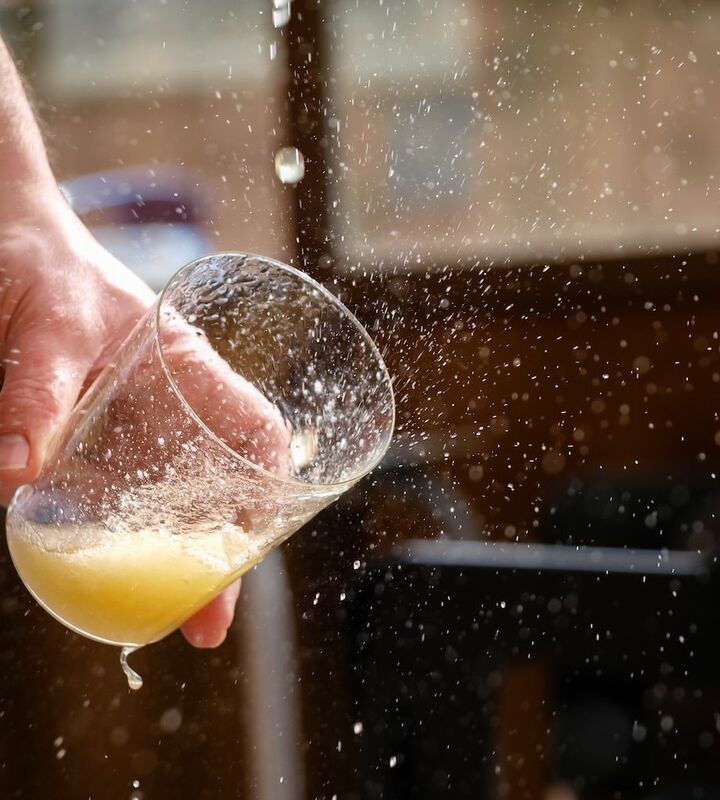 Basque cider traditions include catching fresh cider right out of the barrel, and it’s as much fun to watch as it is to partake in. The cider is dry rather than sweet and pairs well with salty dishes. The region is also known for txakoli (pronounced “chah-kuh-lee”), which is a dry, slightly sparkling white wine. It’s crisp and high in acid, making it the perfect accompaniment for a rich pintxo. If you like vinho verde, you’ll love txakoli. For less alcohol, try the kalimotxo. This long drink is equal parts red wine and cola served over ice. It’s a surprisingly mild and refreshing combination. The cola calms the tannins in the wine while the wine balances out the sugar in the cola. Although it’s popular with teens, kalimotxos are served at nearly every bar, so you won’t look out of place ordering one. Be prepared for bars crowded with locals during the pre-dinner hours between 8:00 and 10:00 PM. Make your way to the bar and be assertive, but polite, when getting the bartender’s attention. You should know exactly what you want to order. If you seem indecisive, you’ll be passed over for someone who’s ready. The rule of thumb is to order one pintxo per person and one glass of wine (or cider, etc). Repeat until you’re content or ready to move to the next bar. Always stay standing with your pintxo and drink, but be sure to move away from the bar to give others room to order. Take note that most places don’t offer seating at the bar. After you’ve eaten your pintxos and used your napkin, ball it up and throw it on the ground. The idea is that it’s more sanitary on the ground than on the bar, especially if it’s crowded and the bartender hasn’t had time to clean up before the next guest arrives. Don’t feel tied to one place. Bar hopping (or pintxo hopping) is common, and locals keep each bar visit around 20 minutes and make a point to enjoy the shop windows on their way to the next bar. If you’re stuck on which place you want to go next, there’s a good chance the bar with more napkins on the floor is the tastier option. Tip: Locals rarely use plates, but tourists have been known to make a mini-meal out of pintxos, ordering three or four while sitting at a table to eat. 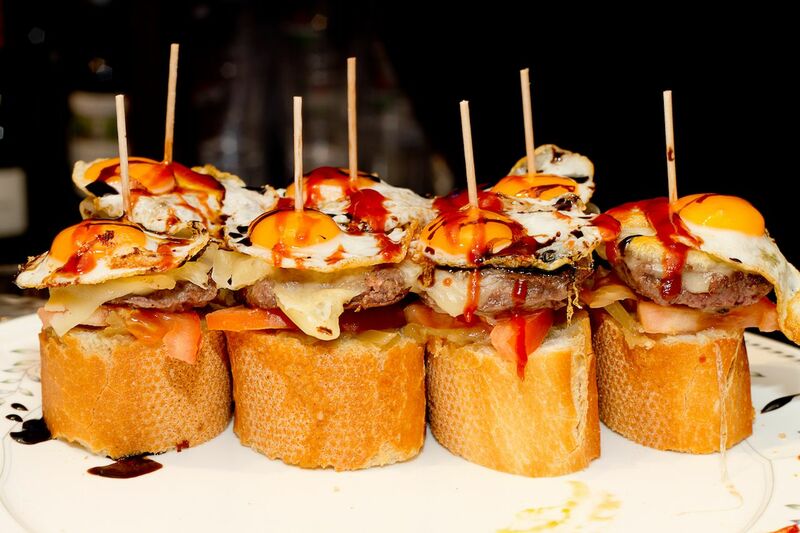 Pay for all of the pintxos and drinks together when you’re done and ready to leave. Simply go up to the bar and let the bartender know that you’d like the check. Some bartenders will tally your pintxos and drinks in their head — a true feat in today’s technology-reliant society. Other taverns count toothpicks while some have you tell them your exact order. If you’re in a larger group, it’s easiest to pay in a single check. Tip: Tipping at bars is totally optional — feel free to round up to the nearest dollar and leave that as your tip.